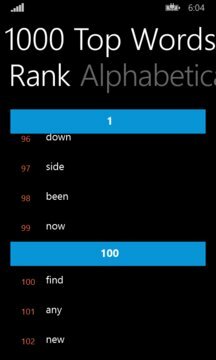 1000 Top Words is a language helper for people wanting to learn or better their English. It's intended for ESL (English as a second language) students around the world but is equally useful to young and school-aged children whose native tongue is English. 1000 Top Words has a simple interface suited for people of all ages. Words are listed alphabetically or according to their ranking. Simply tap a word and hear the pronunciation. 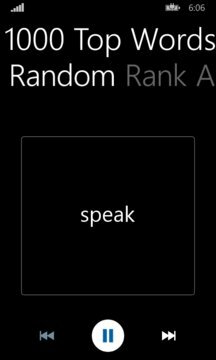 The random word feature allows you to practice your pronunciation. Every time you tap Next, you will be shown a new word, which you can try and pronounce yourself, and then tap to hear how it is pronounced. Auto-play option can speed up the process.